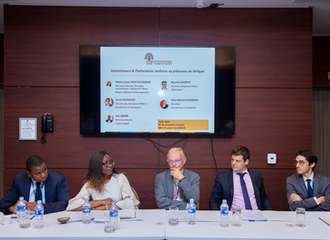 On October 16, 2018, Investisseurs & Partenaires (I&P) hold for the first time its General Assembly in Africa, gathering about twenty investors in Abidjan. At this occasion I&P hold a press conference to highlight the rapid expansion of its team, especially in Africa, its ambitious recruitment objectives in all its countries of operation and the launch of 5 new impact funds in sub-Saharan Africa over the next 5 years. I&P is gradually extending its presence in Africa, through the start of new activities and the recruitment of additional team members in its 7 African locations (Burkina Faso, Cameroon, Côte d’Ivoire, Ghana, Madagascar, Niger, and Senegal). Out of fifty employees, 33 are based in Africa and 32 are Africans. Often young and well-trained, African-based teams are rapidly developing skills and are becoming more and more autonomous. This new managerial structure is more suited to the reality of African economies, particularly with a view to rapidly increasing the number of companies in which I&P will invest in the coming years. In the meantime, IPDEV 2 is pursuing its investment programme: training, sponsoring and supporting ten impact funds in ten African countries to eventually support 500 small businesses. To date, five funds are already operational, in Burkina Faso, Côte d'Ivoire, Madagascar, Niger and Senegal. Together, they have already financed 27 SMEs, in equity and seed capital, and raised €15 million from African and international investors. Thanks to its second and final closing, announced early October, IPDEV 2 raises its capital to €21 million and should launch a new impact fund in Mali and another in East Africa. Through this innovative mechanism, IPDEV 2 contributes to promoting the emergence of new champions of African entrepreneurship and building a community of investment professionals across the continent. I&P's commitment to African development is implemented through various funds, whose philosophy remains the same: entrepreneurial spirit, commitment to development, integrity and high standards. The strength of I&P lies in this continuum of investments to boost African entrepreneurship. In addition to IPDEV 2, the fund IPAE 2 also embodies this dynamic and complete I&P’s investment offer to match the needs of African SMEs. With a target size of €80 million (a second closing between €70 and 75 million will be announced by the end of 2018), IPAE 2 aims to invest in equity and quasi-equity in 30 to 40 startups and SMEs over the next five years in Sub-Saharan Africa, particularly in West and Central Africa, but also in East Africa and Madagascar. IPAE 2 is a generalist fund that supports companies operating in various sectors (such as agro-industry, microfinance, health, education, construction...), with an investment ticket size that can reach up to €3 million. Besides equity investment, IPAE 2 provides companies with active participation in their governance, personalized managerial support and technical assistance resources, enabling them to reach their full potential in terms of growth and impact. ESG (Environment, Social, and Governance) issues and impact measurement are at the heart of IPAE’s investment model. Early October, I&P announced that IPAE 2 carried out its first investments in three companies (Afribon, African Management Initiative, CoinAfrique). Operating in various sectors of activity, the first companies of IPAE 2 portfolio share a common feature: the choice to develop their activities, from the outset, in several African countries. Two of them also share a strong technological component.